Here's a gimmick that never really caught on. 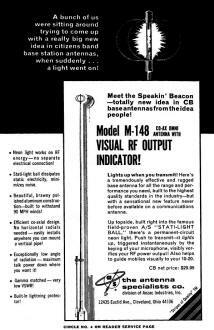 In the 1960's, Antenna Specialists promoted their Model M−148 Co-Ax Omni Antenna "with visual RF indicator." 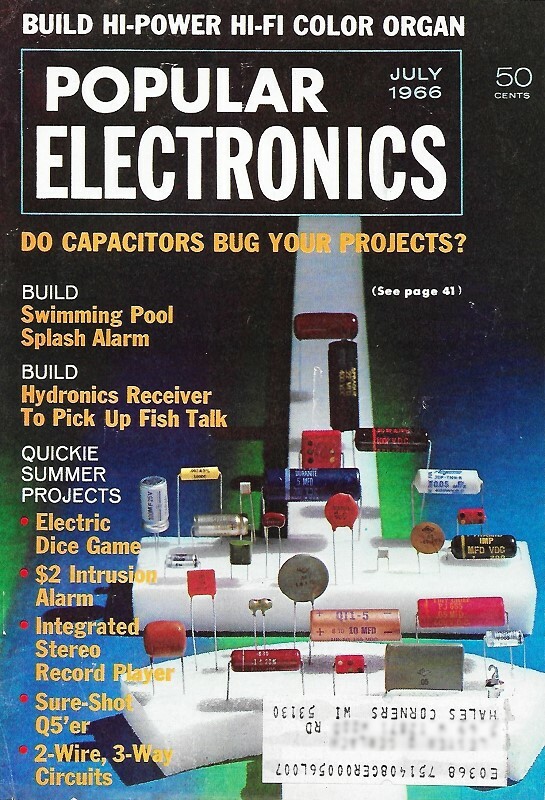 That indicator was a neon light bulb at the tip which lit up when the transmitter was keyed on. Not only would this novel feature let you know when your transmitter was broadcasting, but it would also "guide mobiles visually to your 10-20." OK, maybe at night, but it certainly wouldn't have been bright enough during the day to even see. Alas, the public evidently didn't impress the buying public as much as it did the designers. Maybe it had something to do with operators not wanting to waste transmitter power for the purpose of lighting a neon bulb. Oh well, nice try. A bunch of us were sitting around trying to come up with a really big new idea in citizens band base station antennas, when suddenly... a light went on! Neon light works on RF energy - no separate electrical connection! Stati-light ball dissipates static electricity, minimizes noise. Beautiful, brawny polished aluminum construction - built to withstand 90 MPH winds! Efficient co-axial design. No horizontal radials needed - easily installs anywhere you can mount a vertical pipe! Exceptionally low angle of radiation - maximum talk power down where you want it! Gamma matched - very low VSWR! Meet the Speakin' Beacon - totally new idea in CB base antennas from the idea people! Model M-148 Co-Ax Omni Antenna with Visual RF Output Indicator! Lights up when you transmit! Here's a tremendously effective and rugged base antenna for all the range and performance you need, built to the highest quality standards in the industry - but with a sensational new feature never before available on a communications antenna. Up topside, built right into the famous field-proven A/S "Stati-Light Ball," there's a permanent-circuit neon light. Push to transmit - it lights up, triggered instantaneously by the keying of your microphone, visibly verifies your RF power output! Also helps to guide mobiles visually to your 10-20.
the antenna 5 specialists co.
division of Anzac Industries, Inc.